The head teacher of an infant and nursery school directly under a Heathrow flight path, close to the airport in Hounslow, has been speaking of the impact of the planes on the learning of children at her school. Kathryn Harper-Quinn, who runs Hounslow Heath Infant & Nursery School said a recent study had highlighted the dramatic impact planes thundering 600-feet overhead have on children’s learning. Asked to recall factual details from an outdoor lesson, she said, a class of 7-year-olds could remember about a third less than those hearing the same lesson in a specially built noise-insulated hut. When the study was repeated with a fictional story, there was no noticeable difference in performance – a result Ms Harper-Quinn put down to pupils being able to fill in the gaps more easily. Speaking at the official launch of Hounslow Council’s consultation on Heathrow, she claimed a 3rd runway would blight thousands more children’s education. The consultation questionnaire contains 11 questions, and the deadline for responses is May 16th. A Headteacher told how aircraft noise can reduce pupils’ comprehension by up to a third as Hounslow Council launched its biggest ever consultation on Heathrow today. Kathryn Harper-Quinn, who runs Hounslow Heath Infant & Nursery School, in Martindale Road, Hounslow, said a recent study had highlighted the dramatic impact planes thundering 600-feet overhead have on children’s learning. Asked to recall factual details from an outdoor lesson, she said, a class of seven-year-olds could remember about a third less than those hearing the same lesson in a specially built noise-insulated hut. Interestingly, when the study was repeated with a fictional story, there was no noticeable difference in performance – a result Ms Harper-Quinn put down to pupils being able to fill in the gaps more easily. Speaking at the official launch of the council’s consultation on Heathrow, she claimed a third runway would blight thousands more children’s education. “The relentless interruption and distraction makes things very difficult for young children learning to speak, read and write,” she said. Questionnaires have been sent to all 100,000 households across the borough asking for people’s views on a range of issues, from a third runway to air pollution. People can also have their say online and at a series of public meetings being held across the borough as part of the survey, which closes on May 16. Hounslow Council has already made its opposition to expansion clear, but council leader Jagdish Sharma said the 11 questions had been carefully worded to ensure the consultation was as fair as possible. The launch comes as both Hillingdon and Richmond councils are preparing to hold holding referendums on a third runway. Asked why Hounslow had not chosen to follow suit, deputy council leader Colin Ellar said he believed this survey would provide more information than a simple tick-box exercise to help the council, airport and the Government better understand the true impact of Heathrow on its close neighbours. He said the results would be sent to the Government this summer. About 11,000 Hounslow residents are employed at Heathrow, according to the council, with many more relying on the airport for their livelihoods. Heathrow has funded noise insulation measures at the 520-pupil Hounslow Heath Infant & Nursery School, along with others in the borough, including the igloo-like adobe hut which reduces noise by 17 decibels and can hold a class of 30 pupils. However, Ms Harper-Quinn said that although this had helped mitigate the impact of the din caused by passing jets it was not a solution. The Airports Commission, chaired by Sir Howard Davies, is investigating the demand for extra aviation capacity in the UK. Its final report is due in summer 2015. Hounslow has launched its consultation on the airport. 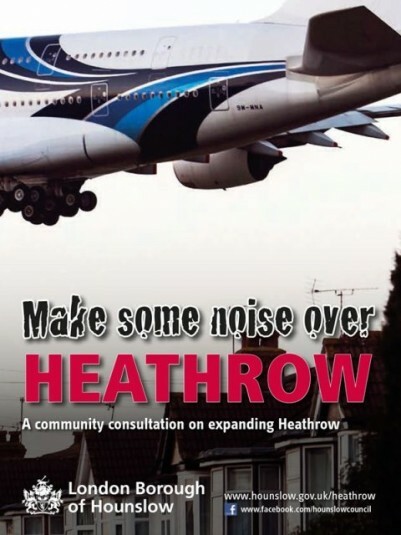 This morning Hounslow Council’s launched its community consultation to Make Some Noise Over Heathrow. It will see a questionnaire sent to every one of the borough’s 100,000 households, inviting residents to have their say. It is the biggest consultation ever carried out in the borough. Richmond and Hillingdon Councils have both committed to a 2-question referendum on which voters can voice their support for expanding Heathrow airport and seeing an increase in flight numbers. The result will be politically and legally binding on both authorities. The Hounslow questionnaire also contains the two questions that are being asked by Richmond and Hillingdon to ensure that residents across West London are being asked to voice their thoughts on the same issues. A community engagement exercise was thought to be a more flexible approach and has allowed Hounslow Council to create a questionnaire with a total of 11 questions. This provides an opportunity for a more in-depth engagement with community opinion and allows the Council to ask questions on the importance of Heathrow to the local economy, seek views on transport improvements and address noise and air quality issues as well the issue of night flights. The community engagement exercise will run over a four-week period. This will enable the Council to campaign for a longer period of time, which will hopefully result in a higher response rate thereby increasing the validity of the overall results. By covering a wide-range of issues relating to Heathrow, Hounslow Council also hopes to galvanise public support for its position on noise, air quality and night flights. In order to support the Heathrow consultation exercise, a series of roadshows will visit each of the borough’s eleven libraries between 15 April and 16 May, providing an opportunity for residents to get additional copies of the questionnaire and ask any questions around the issue of further expansion at the airport. The main purpose is to increase participation in the consultation. Staff will be on hand to proactively ask residents if they have received the consultation document through the door, if they have completed the questionnaire online, or if they would like more hard copies of the document for themselves, family or friends, in order to increase participation. This exercise by Hounslow will be quantitatively and qualitatively very different from the Richmond & Hillingdon referendum and will usefully produce information about the how local residents feel the trade-off between job and quality of life issues over Heathrow should be managed rather then a yes or no approach. I look forward to seeing Hounslow submitting their data to the Davies Commission. Children living under the Heathrow flight path are suffering two-month lags in their reading development as a result of aircraft noise. Hounslow council says pupils in the borough have to put up with “continual disruption”, and warned the problem will worsen if the airport expands to three or more runways. Around 40 schools are directly under the Heathrow flight paths with planes landing every 90 seconds or so much of the day. The council cites an international study by London University into aircraft noise which found it led to a “significant impairment” in reading development, as well as affecting long-term memory and motivation. As well as a 2-month delay in reading, the children’s education is suffering from the continual disruption from low-flying jets. If schools don’t have triple glazing the interruptions to lessons can be relentless. One school near the airport has had shelters installed in the playground so children can escape the noise. A 2010 ECRD study suggested that chronic aircraft noise has a deleterious effect on memory, sustained attention, reading comprehension and reading ability. includes a short video clip. A new study suggests students at schools under the Heathrow airport flight path take two months longer to develop their reading skills than other children. Researchers from the University of London looked at the effect of noise on concentration levels of pupils at 40 schools in west London. A Heathrow airport spokesman said: “We know aircraft noise can disturb people living under the flight path which is why we offer a variety of schemes to reduce the impact of noise. BBC London’s Marc Webber spoke to Katherine Harper, head teacher at Heathrow Heath Infants School and councillor Colin Ellar, deputy leader of Hounslow Council. Posted: Monday, April 15th, 2013. Filed in News about Airports, Noise News, Recent News.